Dr. Bleeker is a board certified Prosthodontist. This means that we are a specialty dental practice devoted to restoring and enhancing the natural beauty of your smile using conservative, state-of-the-art procedures that will result in beautiful, long lasting smiles! We are committed to helping our patients obtain and maintain optimal oral health and aesthetics. We provide compassionate dental treatment and offer a range of services from routine dental care such as crowns, bridges, fillings, dentures and dental cleanings to complex implant rehabilitations and prosthetic treatment for head and neck cancer patients. We are dedicated to helping you with your oral health needs. A standard of excellence in personalized dental care enables us to provide the quality dental services our patients deserve. We provide comprehensive treatment planning and use prosthetic, restorative and cosmetic dentistry to achieve your optimal dental health. Should a dental emergency occur, we make every effort to see and care for you as soon as possible. Dr. Bleeker is a true believer that preventive care and education are the keys to optimal dental health. He strives to provide “dental health care” vs. “disease care”. That’s why we focus on thorough exams – checking the overall health of your teeth and gums, performing oral cancer exams, and taking x-rays when necessary. We also know that routine cleanings, flossing, and fluoride are all helpful in preventing cavities and periodontal disease. Not only are we focused on the beauty of your smile, we’re also concerned about your systemic health. A review of your medical history can help us stay informed of your overall health, any new medications, and any illnesses that may impact your dental health. Infection control in our office is very important to us and our patients. To protect our patients and ourselves, we strictly maintain sterilization and cross contamination processes using standards recommended by the American Dental Association (ADA), the Occupational Safety and Health Administration (OSHA), and the Center for Disease Control (CDC). As your dental health professionals, we want you to be confident knowing that we are a team of highly trained and skilled clinicians. We pride ourselves in providing the care you need to keep your smile healthy. To give you the best possible service and results, Dr. Bleeker is committed to continual education and learning. He attends dental lectures, meetings, and dental conventions to stay informed of new techniques, the latest products, and the newest equipment that a modern dental office can utilize to provide state-of-the-art dental care. Dr. Bleeker is also a board member for the Synergy Dental Study Club. Our study club is dedicated to providing continuing dental education to our referring general dentists. If you are a referring general dentist and you are not a member of the Synergy Dental Study Club call and find out more about the club and ask us how to join. Also, being members of various professional dental associations helps us to stay abreast of the changes and recommendations for our profession. Visit our links page to see our membership organizations. Building a foundation of trust by treating our patients as special individuals is vital to our success. We understand how uneasy some patients may feel about their dental visits, and how we can make a difference in providing a relaxing and positive experience. Call and ask about sedation dentistry to see if this is an option for you. Sedation dentistry is the best way to minimize the stress and anxiety associated with dental treatment. Our entire team is dedicated to providing you with excellent, personalized care and service to make your visits as comfortable and pleasant as possible. We want you to come back and be confident in referring your family, friends and associates. 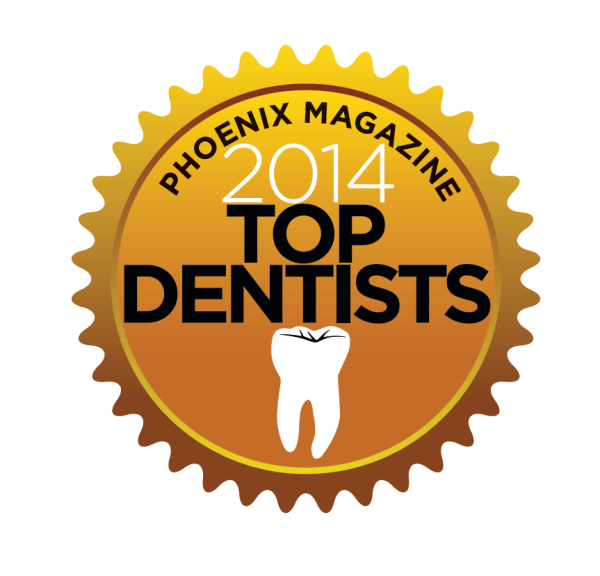 as a 2012, 2013, 2014 & 2015 Top Phoenix Dentist.